Why a diesel generator from Yicheong Power? Generators product from Yicheong Power is built with only the highest quality generator components,but price is very competitive.Our generators are built with the highest quality diesel engines in the world,Such as Cummins,Perkins,MTU. Further, our generator ends are also of the highest quality, including Marathon alternator, Cummins generator(newage stamford) alternator and Leroy Sommer alternator. Yicheong Power always maintains their generators in stock. With an average supply of over 200 diesel generators, Yicheong has the ability to ship our generators the same day. This is unheard of in the diesel generator industry. While our diesel generator competitors make customers wait months, or even years, Yicheong Power has the stock needed for our customers. In addition to our stock of diesel generators, we stock transfer switches, fuel tanks, trailers and a full line of accessories for all power needs, available for immediate shipment. 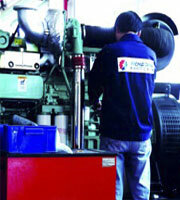 Yicheong Power service staff has a combined 10 years in the diesel generator industry. We have a world-wide service organization to service your diesel generator anywhere, anytime. Further our diesel generator technicians are always available to service your diesel generator via email or telephone. We stand behind our diesel generator anywhere it is located in the world.